User Roles and Permissions in Vend – How can we help? The cashier is a great user level to assign to your non-management staff. They are able to do things like process sales, transfer stock and close off the register but are restricted from management functions such as adding and editing products and users. The manager user level represents the person in charge at one outlet. The Manager user is able to do everything a cashier can in addition to having access to their assigned store's reporting and ability to add and edit products if necessary. The admin user level is intended for the store owner or the head office account. As an admin user, you will have full access to view & change all stores within your account. If you'd like more than one person to have full permissions, it is possible to create multiple Admin users. 1. Navigate to Setup in the side menu and choose Users. 2. Locate the Roles tab along the top of the user page. 3. On the roles page you will see your three user roles; Cashier, Manager and Admin. Click on one of these role names to view their permissions. 4. When you click on a role name you will see a list of permissions for this role. Depending on your pricing plan the role will have editable or pre-set permissions. Permissions are defined with a tick or a cross, a tick giving the role access to an action and across denying them access. Note: If you are on an Advanced or Multi-Outlet (or our latest Pro and Enterprise) plans, you will also be able to customise these permissions. To learn more about this click here. For the cashier role, you will also have the option to enable or disable the returns and discounting features manually. If you want to customise any of the other permissions, you will need to make sure you are on an Advanced or Multi-Outlet (or our latest Pro or Enterprise) plan. Note: Advanced User Permissions are only available for customers on Advanced or Multi-Outlet plans (or our latest Pro and Enterprise plans). If you aren’t sure what plan you’re using, head to your Account page in Vend to access Advanced User Permissions. With Vend's Advanced User Permissions, you have even more control over what your employees can see and do by customising the permissions within user roles. 3. On the roles page you will see your three user roles; Cashier, Manager and Admin. Click on one of these roles to customise the role. 4. On the customisation screen will be a series of tick boxes. Ticking these boxes on or off will enable or disable the corresponding functions for this user group. 5. With Cashiers, we can, for example, allow them to process returns on sales but not perform discounts on sales by ticking and unticking the corresponding fields. Any changes you make on this screen will be saved automatically and come into effect the next time the user signs into the store. Note: You do not need to set permissions for each new employee that joins your team. When you are setting up a new user, assign them the relevant role, and they will have the same permissions as all staff at their level. Having the Product Costs permission enabled allows your cashiers or managers to view and calculate the cost price of the products you sell and what kind of markups you might have. You can tick this option if you'd like your cashiers or managers to view your product costs on the sell screen, in the product catalogue, in reporting and stock control. This is turned off by default for cashiers and turned on by default for managers. By default, cashiers and managers are allowed to print product labels. You can untick this option if you would like to prevent your cashiers or managers from printing labels. Discounts are turned on by default for cashiers and managers, but you can use this field to disallow this if you wish. Under the "Sell" section you can customise the permissions for sale related activities such as performing on-account and layby sales, processing returns and exchanges, manually issuing store credit or editing and voiding sales. All these options will be turned on by default for managers. However, the option to manually issue store credit and edit and void sales will be turned off by default for cashiers. Under the "Customers" section, cashiers will have permission to add new customers in Vend or via a CSV. However, they will not be allowed to remove a customer or add one to a customer group. Managers, on the other hand, have full permission for changing, editing and removing customers. You can also customise whether you'd like your cashiers and managers to have the ability to export customer lists as a CSV in this section. You can customise whether you'd like your cashiers and managers to be able to create and edit products, create price-books, perform inventory counts, stock orders and returns. By default, cashiers will have inventory counts, stock orders and stock returns turned on. 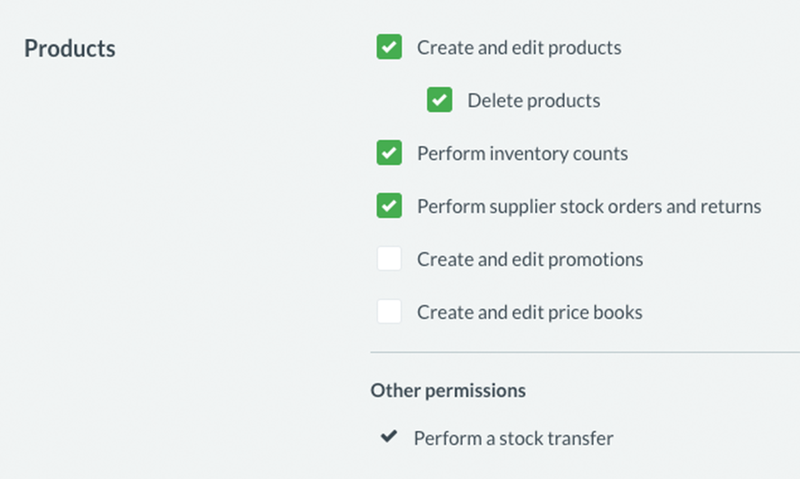 All product-related permissions will be on by default for your manager user. Under Reporting, you can specify which sales your users have access to. You can choose between allowing your users to view reports on sales that the user has made, or reports on all sales made at outlets the user is assigned to. All setup options are locked for cashiers and cannot be changed; managers are also locked out of most setup functions however they can add and edit other cashiers and managers as well as manage quick keys.